HARD SPUN (USA) (Bay 2004-Stud 2008). 7 wins-3 at 2, Saratoga King's Bishop S., Gr.1. Sire of 976 rnrs, 664 wnrs, 62 SW, inc. Questing (Saratoga Coaching Club American Oaks, Gr.1), Le Romain, Hard Not to Like, Hard Aces, Ertijaal, Wicked Strong, Smooth Roller, Hardest Core, Zo Impressive, Promising Run, Big John B, Gatting, Moviesta, Fursa, Tarquin, San Nicasio, Red Duke, Text'n Hurley, Timeline, Island Town, Maftool, Taghleeb, Reload, etc. Galaxy Raider (g. by Hard Spun). 3 wins. See below. Race Record: 21 Starts 3-6-3 A$157,200. 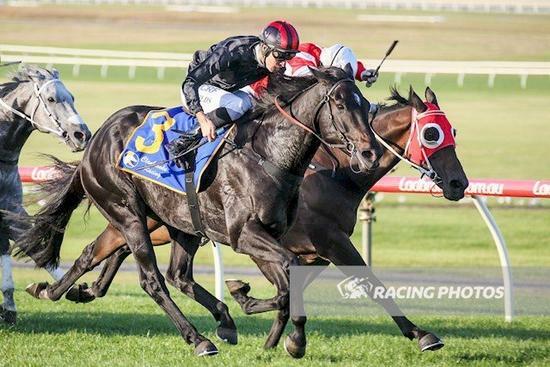 3 wins to 1400m, A$157,200, to 2017-18, MRC Clanbrooke Racing H., Cove Hotel P., 2d Ballarat TC Suez McKellar Mile H., Bendigo JC Mypunter.com H., MRC Cove H., VRC Cafe Adamo H., 3d VRC Nursery H., MVRC Simpson Construction H.